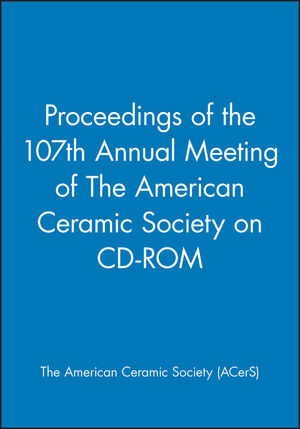 This CD-ROM of the Proceedings of the 107th Annual Meeting of The American Ceramic Society consists of nearly 200 peer-reviewed papers presented at the meeting from over 20 symposia. Topics include bioceramics, electronics, environments and waste management, composites, armor, fuel cells, glass and optical materials, cements, advanced processing and nanotechnology. The American Ceramic Society (ACerS) is a 100-year old non-profit organization that serves the informational, educational, and professional needs of the international ceramics community. International Symposium on Nano-Structured Bioceramics: A New Frontier in Advanced Biomaterials. Complementary Fungus-Derived Micro-Porosity in Nano Materials. Development of Aqueous Sol-Gel Method for Synthesis of Nanostructured SiO2-BaO. Chemically Bonded Nano-Size Bioceramics Based on Ca-Aluminate. Formation of Apatite Coatings on Chemically Bonded Ceramics. Nanoindentation and Scanning Probe Microscopy. Investigation of Ceramics and Ferroelectric Materials by Atomic Force Acoustic Microscopy. Nanostructures, Nanophenomena, and Interfaces in Ferroic Materials and Thin Films. High Performance Thin Films for Microwave Phase Shifter Applications: Device Requirements, Material Design, and Process Science Considerations. Coupling of Magnetic Order, Ferroelectricity, and Lattice Strain in Multiferroic Rare Earth Manganites. Separation of Lattice Structural Effects and Electronic Contributions to Physical Properties with Nanotechnology. Preparation of ZrO2 Nanoparticles and Nanostructured Coatings Via Modified Emulsion Precipitation. Growth of Tube-Like B-N Compounds by Chemical Vapor Deposition (CVD). Incorporation and Characterization of Carbon Nano Tubes in Random Hole Optical Fibers. Dye Senzitised Solar Cells: A Comparative Study Using Different Nanocrystalline-Titania. Molecular Routes to One Dimensional Nanostructures. High Shear Casting of Nanoparticulate TiO2. Multi-Scale Agglomerate Synthesis by Homogeneous Precipitation. Increased Osteoblast Functions on Nanophase Hydroxyapatite Coatings on Titanium. Interaction of DNA with Nano-Structured Beta-Gallia-Rutile Surfaces. Co-Precipitation Synthesis of Nano-Sized Yttrium Aluminium Garnet (YAG) Powders. Synthesis of Silicon Carbide Nanowires from a Mixture of CaCO3 and Si Powders. Grain Growth of Sol-Gel Derived Tin Oxide Nanoparticles and the Effects of Platinum Doping. Synthesis and Densification Studies of Nanocrystalline Titanium Dioxide Ceramics. Nanotechnology for Neutralization of Terrorist Explosives. In-Situ Processing for New Composite Systems. Spatially Resolved Synchrotron X-Ray Diffraction Phase Analysis of In-Situ Strain Induced Ceramic Components. In-Situ Synthesis and Characterization of SiC - Al2O3 Composites. Innovative Processing and Synthesis of Ceramics, Glasses and Composites. Adhesion-Non Adhesion Behavior of Non-Polar Solvent Based SiC Slurries for Electro-Photographic. Advanced Robot Assisted Process for the Series Production of Optimized Oxide Ceramic Coatings on Textile Surfaces. HfC Structural Foams Synthesizing from Polymer Precursors. Effect of Aluminon Aqueous Solution Chemistry on the Homogeneity of Compacts by Colloidal. Chemical Reactivity: In Search of Better Processing of HfB2/SiC UHTC Composites. Low Cost Preparation of High Quality Aluminum Nitride Powders and Whiskers. Fabrication of Colored Glasses by Incorporation of a Secondary Nanosized Phase into a Silica Green Body by Means of Reactive Electrophoretic Deposition (REPD). Densification of Single-Grain verses Multi-Grain Zirconia Powders. Measurement of the Internal Pressure in Green Multilayer Ceramic Bodies During Binder Removal. Microstructural Evolution and Creep Properties of Plasma Sprayed. Inorganic Crystalline and Amorphous Fibers - Science and Technology. Glass Fibers Industry: Evolutions of Glass Compositions. Processing, Properties, and Applications of Porous Ceramics. Biologically Derived Nano and Micro Porous Material. Effect of Porosity on Mechanical Properties of a High Purity Alumina. Characteristics of Photocatalyst Inserted on Surface of Porous Aluminosilicate. Development of an Autonomous Humidity Controlling Material with Nano-Sized Pores. Fabrication, Characterization and Deposition of Materials from Liquids in Random Hole Optical Fibers. Explorations into Ceramic Surfaces, Grain Boundaries and Interfaces. Critical Wetting Phenomena in the Ag-CuO System. Rayleigh Instabilities in M-Plane Sapphire. Interface Structure and Atomic Bonding Charactersitics in Silicon Nitride Ceramics. An Interfacial Characterization of Pd-Ag-CuO Reactive Air Joints with Alumina. Permeability and Adhesion Measurements of Laminated Barium Titanate Green Ceramic Tapes. Grain Boundary Segregation and Conductivity in Yttria-Stabilized Zirconia. Reactive Air Brazing (RAB) for Ceramic-Metal Joining. Residual Stress in Ceramic Coatings on Si3N4 Ceramic Substrate. Tailoring Open Porosity in Biphasic HAP/TCP Materials Via Vapor-Phase Transport. Biodegradation Behavior of Tricalcium Phosphate Ceramics. Hydroxyapatite / PMMA Bio-Composites: An In Vitro Evaluation. Evaluating Ceramic-Ceramic Bond Strengths Using Metal-Ceramic Characterization Techniques. Synthesis and Characterization of Nanocrystalline Hydroxyapatite Ceramics. Defect Engineering of Samples for Non-Destructive Evaluation (NDE) Ultrasound Testing. Dynamic Response of B4C-SiC Ceramic Composites. Characterization of Subsurface Damages of Static and Dynamic Indented Armor Ceramics: SiC and Si3N4. Compressive Failure Threshold of Brittle Materials. Synthesis of Dense B4C-SiC-TiB2 Composites. Biomorphic Reaction Bonded Silicon Carbide Ceramics for Armor Applications. Microstructural Engineering of the Si-C-Al-O-N System. Reaction-Bonded SiC Composites without Residual Si. Advanced Ceramics for Personnel Armor: Current Status and Future. Ceramic-Polymer Composites for Ballistic Protection. Characterization of AlON™ Optical Ceramic continued. Defining Microstructural Tolerance Limits of Defects for SiC Armor. Processing of Oxide/Oxide Composite Components for Efficient Energy Conversion Applications. Ultrasonic NDE of Reaction Bonded Ceramics. Microstructural Investigations of Reinforcing Materials in Zinc Phosphate Composites. Disposition of Water in Metakaolinite Based Geopolymers. Matrix and Interphase Design of Geopolymer Composites. Modeling Si/Al Ordering in Metakaolin-Based Geopolymers. On Mix Compositions of Fly Ash Based Inorganic Polymeric Materials. Damage Morphology of C/C-SiC Composites Under Impact Tests. Effects of Temperature and Steam Environment. Creep-Rupture Behavior of NextelTM720/Alumina (N720/A) Continuous Fiber Ceramic Composite – Effects of Temperature and Steam Environment. The Role of Yttrium Segregation at the Grain Boundaries. Microstructure and Mechanical Properties of Polymer-Derived Al2O3-SiC Micro-Nano Composites. Dielectric Behavior in Ni0.93Co0.02Mn0.05Fe1.95O4-_ PZT Composites. Poly[(Alkylamino)Borazine]-Derived Boron Nitride Fibers for Composite Applications. High-Temperature Thermal Conductivity of Alumina-Reinforced Zirconia Composites. Synthesis of Silicon Carbide Powders from Homogeneously Mixed Precursors. Their Application in Ceramic Matrix Composites. Electronic Ceramics for Extreme Environments. Micro-Raman Spectroscopy of a Vickers Indent on Soft PZT. Thermophysical Properties of Perovskite Type Alkaline Earth Hafnates. Extreme Environment Potential of Diamond Derived Devices. Dielectric Powder/Polymer Composites for High Energy Density Capacitors. Aluminum Nitride Dielectrics for High Energy Density Capacitors. Electrical Properties of Microwave Plasma Chemical Vapor Deposited Diamond Thin Films. R-Curve and Stress-Strain Behavior of Hard and Soft PZT Ceramics. Dielectric Properties of Suspensions Containing BaTiO3 Particles. Barium Strontium Titanate Glass Ceramics for High Energy Density Capacitors. Enhancement of Crystal Growth in Melt Texturing Ca-Doped Y-Ba-Cu-O Superconductors. International Symposium on Fuel Cells and Related Systems. Fabrication of SOFC Electrodes by Impregnation Methods. Self Healing Glass Seals for Solid Oxide Fuel Cells. Intermediate Temperature Solid Oxide Fuel Cells. Anode Supported Solid Oxide Fuel Cells with Improved Cathode/Electrolyte Interface. Anodes for Direct Methanol Fuel Cells. Long-Term Effects in Ag-CuO Brazes under Dual Reducing/Oxidizing Gas Conditions. Design, Preparation, Processing, Properties & Applications. Large Spontaneous Polarizaion in Suprelattice-Structured Bismuth Layered Ferroelectric Crystals. Synthesize Ultra Fine Dielectric Powders. Molecular Designing of Fine Particles Using Aerosol Synthesis. Processing & Properties of Inorganic/Organic Dielectric Nanocomposites. Size Effect of Dielectric Properties for Barium Titnate Particles and its Model Using Two Factors. Thermodynamics of Tunability in (Ba0.60Sr0.40)TiO3 Thin Films. Deposition and Single-Step Processing of YBCO Thick Films for Multilayered Electronics. Wettability Considerations for Sub-Micron Base Metal Electrodes in BaTiO3 Multilayer Capacitors. Sintering Behavior of Ni-Cu-Zn Ferrites for Multilayer Inductors. Capacitors with Ni Internal Electrodes. Complex Permittivity of Calcium Copper Titanate Ceramics with a Bimodal Grain Size Distribution. Isotropic Optical Properties of Epitaxial PLZT Thin Films. Laser Transferred Sol-Gel PZT Thin Films. High Performance Barium Strontium Titanate Thin Film Capacitors for Decoupling Applications. Synthesis and Characterization of C-N Thin Films Deposited on Si (100) Wafer by MPCVD. Effect of Porosity on the Electrical Properties of Y2O3-SrTiO3 Internal Boundary Layer Capacitors. Properties of Lead Magnesium Niobate-Lead Titanate Ceramics. Dielectric and Magnetoelectric Properties of 1-x NBT – x BF Solid Solutions. Dielectric Properties and Phase Transition in Sb/Mn and La/Mn Codoped BaTiO3 Ceramics. Growth of Single Crystal Ferroelectric Fibers and Tapers for All Fiber Network Applications. Aerosol Deposition for Fabrication of High Speed Optical Micro-Scanner. Lead-Free Piezoelectric Ceramic Based on (Bi1/2Na1/2)TiO3-(Bi1/2K1/2)TiO3-BaTiO3 Solid Solution. Giant Electromechanical Coupling Factor k31. Novel Routes to Ferroelectric Gadolinium Molybdenum Oxides. Embedded Ceramic Passive on Fr-4 Using Aerosol Deposition. Internal Stress and Capacitance Aging of BME-MLCCS. Piezoceramic Thin-Film Multilayer Resonators on Crystalline Dielectric Substrates. The PTCR Effect of Donor-Doped Barium Titanate: Origin of the Surface States at the Grain-Boundary. Dielectric and Pyroelectric Behavior of (Ba1-xSrx)TiO3 Composites with Oxide Additives. Novel Dielectric Crystals: Ternary Selenides. International Symposium on Advanced Dielectrics for Wireless Communications. Dielectric Properties of High-K LTCC Materials. for Frequency Agile Microwave Device Applications. Effect of Bias on Nucleation and Growth of Diamond Films. Indoor Air Pollution Control: Formaldehyde Adsorption by Zeolite Rich Materials. Molybdenum-Oxide Based Sorbants for Toxic Metals. Recovery of Palladium Via a Vitrification Process. Computational and Experimental Studies of the Radiation Response of Gd2Ti2O7 Pyrochlore. Hollandite-Rich Ceramics for the Immobilisation of C.
General Recipe and Properties of a Four Inch Hydroceramic Waste Form. Induction Heated Cold Crucible Melter Testing with Troublesome High Level Waste Components. Modeling Melt Rate for DWPF: A Preliminary Assessment. DWPF Melter Glass Pump Implementation and Design Improvement. Characterization of Alteration Phases on HLW Glasses after 15 Years of PCT Leaching. Electronegativity and Basicity of Network Formers. Effects of Aging and Temperature on the Rheological Properties of Simulatedmelter Feed Slurries for Nuclear Waste Vitrification. Iron Covalency Assumptions and Redox Equilibrium in Vitrification. Preliminary Control Strategy for Hanford Low-Activity Waste Glass Formulation. Revisiting the SO4 Limit for the Defense Waste Processing Facility. Stabilized Intergranular and Surficial Films: Progress from the NANOAM Project. Legal and Environmental Health and Safety Issues Facing Artists and Ceramic Engineers. Electrically Conductive Mechanisms for Al2O3-C-TiCN Ceramics. Basic Science Division Focused Session 2 - Powder Synthesis and Processing. Novel Aqueous Tape Casting Process. Removal of Organic Additives from Consolidated Ceramics. Non-Polar Sic Based Slurries for ESFF Applications. Characterization and Properties of Calcium Silicate Hydrate Polymer Nanocomposites. Portland Cement, Blast Furnace Slag and BaCO3. Durability of Well Cements: Corrosion by Carbonic Acid. Glass and Optical Materials Division. Electrical and Optical Properties of Phosphate Glasses Containing Multiple Transition Ions. A Tunable Inorganic Blotting Membrane for Analysis of Gel Separated Biomolecules by MALDI-MS.
Bioapplications for Photo-Hydrolyzed Glass Surfaces. Electrophoretic Deposition (EPD) – What are the Fabrication Limits? Incorporation of Nano Materials in Random Hole Optical Fibers. Glass Ceramics for Solid State Lighting. Selective Batching for Improved Commercial Glass Melting. Patents: Tapping a Valuable Resource. Formation of Metallic Copper Clusters in Silica Based Glasses. In-Situ Observation of Relaxation Process in F-Doped Silica Glass by Raman Spectroscopy.